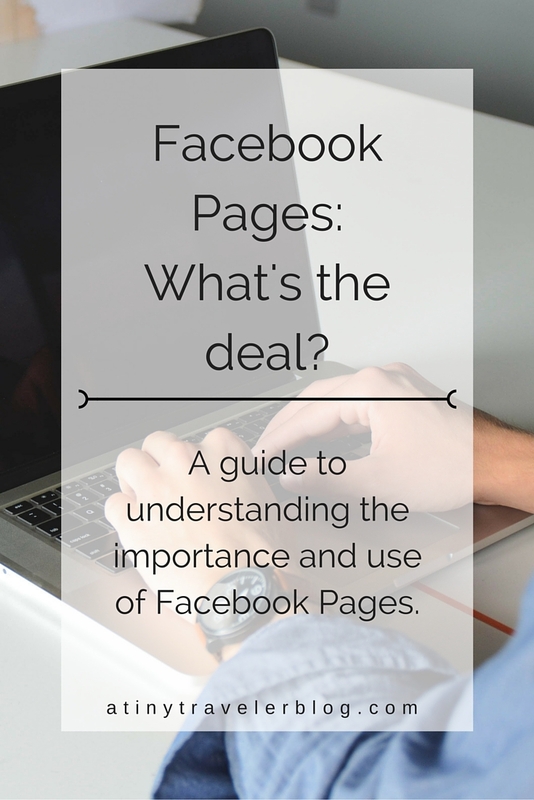 So What's the Deal with Facebook Pages? Today I want to chat with you guys about Facebook. It's fast, easy, and sometimes awkward. You know what I mean, when you post something creative + artsy and a relative posts a comment asking when you'll be visiting again. It doesn't really go with the post and you're not sure where you should respond... Am I the only one? Well anyway, I've realized that at times it would be nice to just have a place where you can post things about your blog or business and it reaches only those interested. Sometimes it can be a little overwhelming or even annoying when you're always posting every new post and creative experience you have on your personal page. But then again, maybe not. In any case, let me re-introduce you to the wonders of Facebook Pages. Facebook Pages is a wonderful addition the world of Facebook. You can now separate your family's beach trip from your blog's top posts; your birthday wishes are no longer mixed in with your new album of photography tips. There is an option to have your cake AND eat it too. Finally! Hooray! So what's the deal with Facebook Pages? Let me tell you. I'm about to dive in to some tips to get the best use of your page, as well as some things to keep in mind for growth and engagement. Got your notepad ready? Let's go. Why Create a Facebook Page for your Blog/Business? + It keeps everything organized. People who want to know more about what you have to say/offer will like your page to keep updated. You can even invite friends and family members individually to like your page and keep up-to-date. + It connects you with similar creatives and businesses. You can find your "niche" of sorts and see what similar pages are up to. Do they have a tutorial you could benefit from? Could you share content with them? Make it all available on your page to get the most out of those interactions. + It can reach people who may not use other forms of social media. This one is huge. I have several friends that don't really use Instagram, Pinterest, Twitter, etc. but they're on Facebook. Having a page might be the only way to reach someone who is truly interested in what you have to say. + You'll be able to direct those with questions to a page that has it all, aside from your actual website. This too is huge. If someone has a question or wants an overview of what you do, send them to your Facebook Page! If they like it, they'll be able to keep up to date. When you send someone over to your website, yes their questions will be answered but they might not have any way to engage or keep in the loop with what you're offering! Giving someone the option to "like" a page is a lot easier than searching for a clickthrough source or email newsletter signup at times. Okay. So now that you've gotten a few reasons why having a FB Page is beneficial, let's talk about mistakes that you don't want to make (or if you've already got a page, ones you might have already made). + Not posting enough content. Facebook has a weird algorithm. They decided when your posts show up on other's feeds. Its unfortunate and their way to try and push their ad services. But do not fear! If you're posting at least once a day, then your content will show up. You can read more here on that tricky Facebook Algorithm. I also LOVE Annalise's advice on Facebook boosts vs. ad management. + Not posting the right content. Make sure you are posting quality content. No blurry or dark photos! Make sure that if you're advertising something or pushing a product, etc. you have an ample amount of info that will compel readers to click the link that you've also provided. + Posting things that are irrelevant to your blog or business. If your FB Page is meant for a business, only post things that have to do with the company and what the company stands for. If the page is for your blog, post links to your blog, a few photos that describe who you are, and share other bloggers content that are in your niche! If your page is for your bakery, posting links to budgeting tips or photos of your cat in the kitchen might not interest your readers (and could even turn some away because it doesn't seem professional). + No engagement. If someone comments on your photo/link then respond! No one likes a quiet page. Even if they commented a few days prior, its not too late. Reply, reply, reply. Engagement is key to build an authentic community that surrounds what you have to say. + Disregarding the Facebook algorythm. It might seem confusing or inconsistent, but Facebook has its own way of doing things. You need to plan and strategize your content around the latest and greatest updates! Social Studio Shop wrote a great post on it that you can read here. + As mentioned before, post relevant content and post quality content. Make sure that when you hit that "post" button you're confident in what you're putting out there and you'll be able to back it up. If you're having second thoughts because you know the image could be brighter or it might sound better worded differently, then fix it. You're more likely to get better results if you're doing your best from the get-go. + People love free stuff! Every few weeks/months, maybe you could host a giveaway on your website and have an entry option be to like your Facebook Page. It'll give you a way to keep in touch with your audience and your audience an opportunity to win something! Or perhaps you could offer a free download, stock images, or recipe cards and post the link on your Facebook Page to make it available to your entire community. If you have any questions about setting up your Facebook Page and getting the most out of it, or on something that wasn't completely covered in this post please shoot me an email at contact@atinytravelerblog.com or comment below! I would love to work with you further on the matter!